This is a gorgeous matched set of Number 8 turquoise stones mounted in heavy sterling by Navajo silversmith Milton Lee. The pendant measures 1 and 3/4 inches long with the bail. It is stamped on the back: M. Lee - Sterling. The sterling chain that comes with it is a heavy one and measures 18 inches. It has a lobster claw clasp. Boulder Turquoise or Ribbon Turquoise is a cut of stone when a stone cutter takes natural Vein Turquoise (Turquoise in its natural host rock) and cuts in the direction to create the vein going through the rock like a ribbon or splotches of turquoise in the host rock like a Boulder Opal. 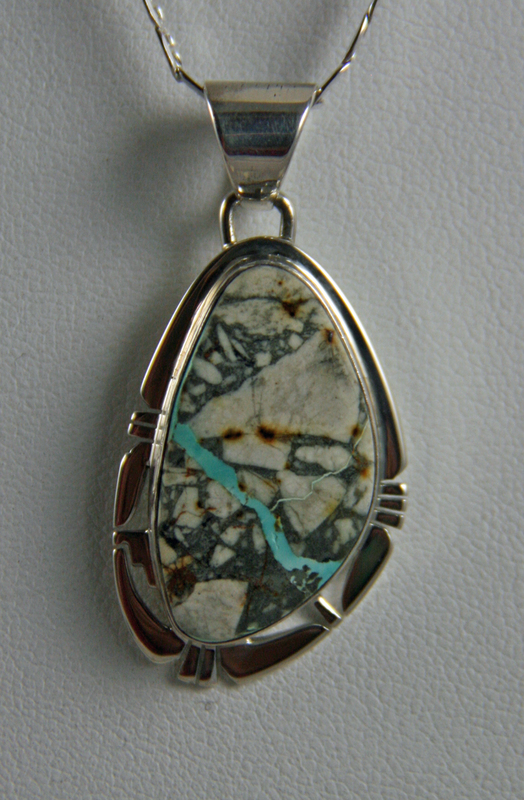 Most Natural Turquoise comes in the vein form as oppossed to nuggets or nodules. 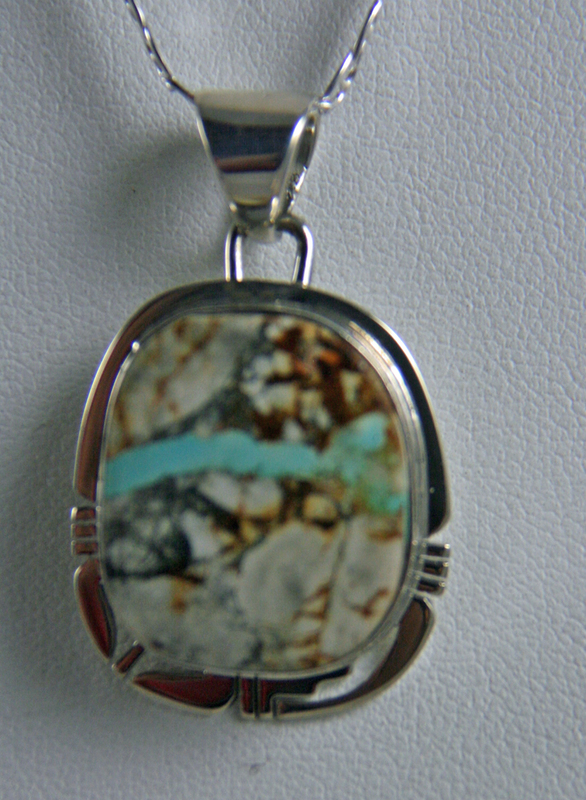 Our Boulder Turquoise is carefully made into beautiful jewelry by Navajo artisans. This is a gorgeous pendant mounted in heavy sterling by Navajo silversmith P. Sanchez. The pendant measures 1 and 3/4 inches long with the bail. It is stamped on the back: P. Sanchez Sterling. The sterling chain that comes with it is a heavy one and measures 18 inches. It has a lobster claw clasp. This is a gorgeous pendant mounted in heavy sterling by Navajo silversmith P. Sanchez. The pendant measures 1 and 1/2 inches long with the bail. It is stamped on the back: P. Sanchez Sterling. The sterling chain that comes with it is a heavy one and measures 18 inches. It has a lobster claw clasp.